You might expect to enter a completely different world when you walk through the gates of San Quentin State Prison. I sure did. I imagined the grounds would be teeming with dangerous inmates being hovered over by intense guards with itchy trigger fingers. Instead, the grounds seemed quiet and deserted. “Hit the town makeup,” the woman who’d checked in right before me, was nowhere to be seen. I couldn’t even tell which entrance she’d used. It seems like the prison staggers the visitor entrances. I wonder if that is purposeful. Another security measure perhaps. So, now I had no idea where to go next (aside from the obvious: “head toward the giant prison.”) I know this place isn’t Disneyland, but a guidepost with convenient arrow-shaped signs would’ve been nice. Adventureland is this way. Frontierland is around the corner. Would that mean death row is No-Tomorrowland? I decided to try the building with the two large turrets first. Its rows of arch-shaped windows sort of made it look like the entrance of a medieval castle. This seemed as good a place as any. The lack of armed guards standing around was surprising, but I was pretty sure they could see me even if I couldn’t see them… and I had no doubt there was fully loaded arsenal inside that gun tower. I walked down the road and approached the first entrance I saw. The heavy steel door slid open for me. Inside there was a small standing area. On the left was another steel door. Straight ahead was the enclosed guardroom. I asked the guard inside if this was death row visiting and he directed me to the next entrance over. The door didn’t open right away this time, and I was worried the guard couldn’t see me. The window in the door was so high up, I wasn’t sure the guard could even see the top of my head waiting outside. I wondered if I should attempt to knock. I even glanced around for a doorbell. “Death Row’s Doorbell” would make a good name for a speed metal band. I stood up on my tippy toes and the heavy steel door opened in front of me. I don’t think those two things were connected, but who knows? The guard probably saw me on a camera (looking for a doorbell like an idiot). It was the same setup as at the other entrance. I walked inside the standing area. There was a place to pass paperwork through the glass into the guard booth, which was raised up a couple of feet. I had to really reach to slide the paper I’d received at check in, and my driver’s license, to the smiling guard inside. He kept the paper and returned my license. The steel door closed behind me. Then the other steel door opened, and I walked inside the visiting area. The large room, lit with florescent lights, held two rows of cages. They were numbered, counting backwards from the far wall. Cages twelve through seven were on the side closest to the entrance, and six through one were on the far side. Cage number one was farthest away. A walkway for the guards divided the two rows of cages. A guard was waiting for me. She told me Daniel was in cage number two. I couldn’t quite see him yet from where I was standing. Now, I was under the impression getting snacks from the vending machines was a big treat for the inmates. I even saw a woman microwaving a hamburger (at 9 am) that she’d just purchased. So I asked the guard if I could have a minute to peruse the snack machines (remember I had a bag filled with quarters and singles), and she told me to find her when I was ready. The guards there are pretty nice actually. Are there Yelp reviews for prisons? I looked over the many food selections, but my stomach was still a little “churny” from nerves. I tried to figure out something Daniel might want. I bought a water bottle for each of us, and a giant “Texas Cinnamon Bun” (no idea why), and placed them on a pinkish brown cafeteria tray I took from a pile near the microwave. I glanced around and caught a glimpse of Daniel standing in his cage. He was smiling at me. I could tell he was happy to see me. I did a little wave at him, and he waved back. I held up one of the water bottles so he could see it (also not sure why). The guard came over to me again and asked if I was ready, but I told her I needed to visit the restroom first. I didn’t know how easy it would be to get let out of the cage for a pee break. I looked for a place to put down my tray. Mental note: Pee first – then vending machines. I decided to dash over to Daniel’s cage and leave it on the floor by the door. I heard him chuckling as I headed to the restroom. The guard was waiting for me when I got back to Daniel’s cage. The cage was about four by eight feet and had two doors in it: one on the visitor side and one on the guard / inmate side. A male guard was in the walkway between the rows of cages, waiting next to the other cell door. Now the guards had to go through a very specific security process to get me inside the cage. Daniel stood with his back to the guard in the walkway and was handcuffed through the bars. Then the guard unlocked the door and Daniel stepped out into the walkway. The door was closed and locked again. The guard on my side unlocked the visitor’s door. I stepped inside. I put my tray on a small white plastic table, that looked like one my daughter had in her playhouse when she was five. There were two molded white plastic chairs in the cage as well. They were normal-sized. The guard on my side closed the door behind me and locked it again. Then Daniel was let back into the cage through the other door and had his cuffs taken off through the bars. Those guards aren’t taking any chances with their safety. I guess for us visitors it’s a “hey you made the choice to come see the guy” level of security. That wasn’t because there were armed guards nearby. Let’s be honest, Daniel is a big guy. I’m a small woman. Technically, he could do some serious damage to my person before a guard could even react. But, when Daniel Wozniak’s cuffs were removed, I walked over to him with open arms. I didn’t even think about not hugging my friend. Hilariously, he immediately got down on his knees so I could reach him. I told him to stand up because I felt like Dorothy visiting the Lollypop Guild. We each took a water, and neither of us ate the cinnamon bun. I actually took that cinnamon bun home with me. My fourteen-year-old son and his friend split it (it was a big bun). Yogurt (peach for him and raspberry for me). Fruit cups with tiny sporks for easy consumption (both visits because they were pretty yummy. A regular Coke for him and a diet Coke for me. Buying the fruit cups on the first day turned out to be challenging and embarrassing. I ended up wasting three dollars because I didn’t realize you need to push a button to move the compartments forward, so you can reach one that isn’t empty. THEN you slide the little door open and take out your fruit cup. Lesson learned. Thank you to the nice lady who had to show me the obvious. Buying coffee was even more embarrassing and also painful. This time I understood how to attain the coffee, but when I fetched the cups from the compartment, I realized just how DIY this caffeinated beverage project was going to be. I remember the old coffee machines: first a cup would drop, and then the scalding hot liquid of your choice would come squirting out of the machine into the cardboard receptacle. The San Quentin vending machine coffee consisted of a cardboard cup with an envelope of Folgers Crystals, a packet of flavored sweetener, and a stir stick inside. I immediately identified one major problem – no hot water. I’d remembered Daniel telling me about the hot water spigot that was in the day room at the Orange County Jail. So, I figured there might be one of those in this waiting room. I wandered around for a bit and then I went to the guard booth to ask about hot water. I bought another bottle of water, filled the cups, and microwaved them (for what seemed like forty-five minutes), in order to boil the water. Finally, I had two mediocre cups of hot coffee. You know what else they don’t have in the San Quentin visiting area? Cup sleeves. There also weren’t any trays left, so I carried the coffee cups in my bare hands back along the row of cages, having to stop every few seconds to quickly put the cups down on some flat surface, just to give my hands a tiny break from the scalding pain. When I finally got over to Daniel, my hands were burning so much that I had to immediately put the cups down in front of the cage, spilling some of the coffee onto the floor in the process. It was against the rules to just hand them to Daniel through the bars. The guard got me some paper towels to clean the spill. If patience is a virtue, then this guard was pretty damn virtuous with me. The coffee was decent. Daniel said it was really good, but asked me why I bought a water bottle instead of getting it from the sink in the restroom. I told him the coffee was good because I didn’t use the restroom sink water. On both Saturday and Sunday, we had five-hour visits that flew by. The two of us were never at a loss for words. Daniel repeatedly told me how much he appreciated that I’d come to see him. Some of you may have made the connection that this was the first time Daniel and I were able to have a non-recorded conversation. You can imagine I had plenty of questions for my book. We had our picture taken together (at both visits). I was a little disillusioned when I discovered Death row doesn’t let you pose in front of a cheesy photo background with palm trees or a sunset. However, the guard was kind enough to let people approve their pictures before he printed them. The visitor gets to take the photos home. 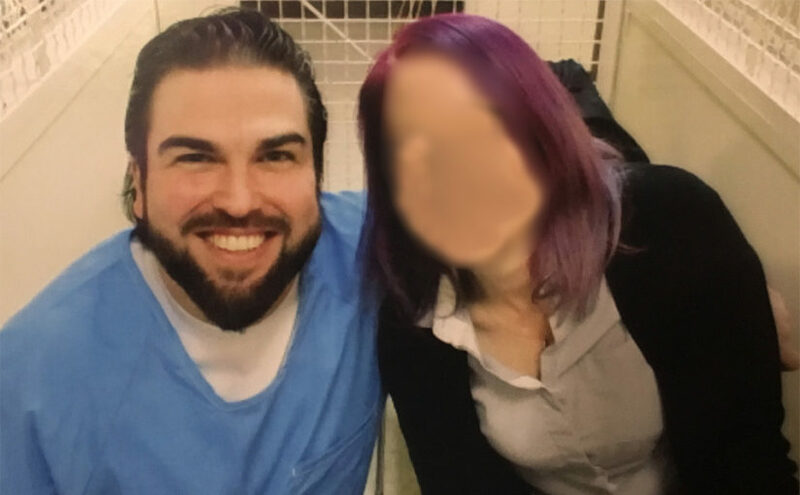 The only way the inmate can get the picture is if the visitor makes a copy and sends it in the mail (which I did). When it came time for me to leave, I gave Daniel another big hug and collected my photos and giant cinnamon bun. The guards repeated the process of handcuffing and musical cell doors. Then I was back out in the fresh air and sunshine…squinting, because I had no sunglasses. My mind was racing as I headed back to the visitor’s building. It was odd thinking I would soon be chatting with friends at a crowded restaurant, while Daniel would be “searched” and locked back into his cell. I didn’t feel sorry for him, though. He made his bed. Because of Daniel Wozniak’s actions, Sam Herr will never get to take another smiling picture with a buddy. Julie Kibuishi will never share another cup of coffee or a funny story. Of course I wish none of this had never happened. But it did, and Daniel is where he deserves to be. When I got back to the visitor’s building, I asked a different guard about my sunglasses in the little basket. He held up a pair, and I took them with gratitude. I was glad to have them back when I got outside again, but they were so smudged with fingerprints I could hardly see out of them. I kept taking them off and cleaning them with the corner of my cardigan. Luckily, I realized before I drove away, that I’d accidentally been given someone else’s bifocal prescription sunglasses instead of my cheap drugstore pair. I hustled back and made the switch with no harm done. I’m hoping I won’t have as many mishaps the next time I visit San Quentin. It will probably be a few months before I can get back. It’s definitely more challenging than visiting Daniel in Orange County. But I will visit him, because in spite of all he’s done, Daniel Wozniak is my friend.